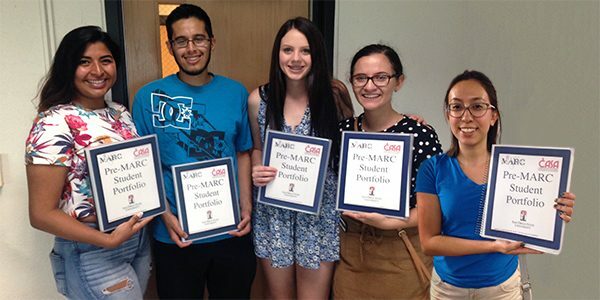 The Pre-MARC SEP is a six-week summer program for SDSU Science, Technology, Engineering, and Mathematics (STEM) majors completing their first or second year at SDSU. MARC and Pre-MARC programs are highlighted in the SDSU Aztec Parents, the Aztec Experience Magazine, fall 2014 issue with a short article entitled “Leaving a MARC”. It covers how MARC provides hands-on research experience and mentorship to underrepresented students. Also highlighted in the article is a Pre-MARC student who talks about how the Pre-MARC Science Enrichment Program (SEP), “prepares students to work in a lab setting while giving the insight into research careers and preparing them for the competitive MARC application process”. We are proud of the accomplishments students in MARC and Pre-MARC have made throughout the years and thank the National Institutes of Health for providing funds to the MARC program to allow the training environment that help students in the program become a success. Access this Link to read the entire article on pages 20-21. This article was written by Whitney Mullen and Kimberly Lamke Calderon. Supported by the NIH/NIGMS SDSU MARC Program, 5T34GM008303.